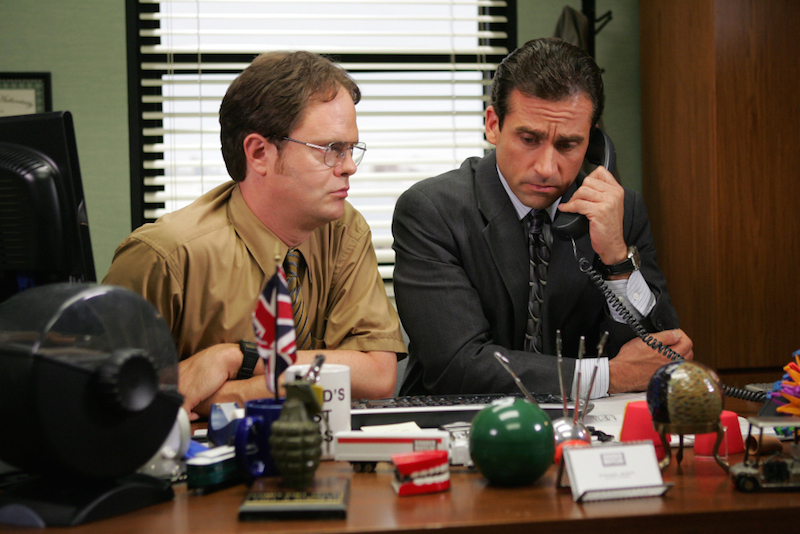 The U.S. Office was an ensemble show that worked because of its rich cast of zany characters. But let’s face it: Michael Scott was the belle of the ball. Steve Carell stayed on NBC for seven of the series’ nine years, and the show launched the actor to comedic acclaim. His career trajectory has only broadened over time; including a transformative turn last year in “Foxcatcher,” for which he earned an Oscar nod and in which he played a psychotic millionaire and wrestling enthusiast. Audiences seemed surprised by Carell’s competence in interpreting a troubled figure, especially after watching him in so much farce over the years. But there’s plenty of darkness and sadness in comedy. Steve Carell’s greatest role — that of Michael Scott — was filled with such complexity. On the surface, the regional manager of Scranton’s Dunder Mifflin paper company was a two-dimensional imbecile; racist, chauvinistic, and culturally tactless. Michael hits an employee with his car (but doesn’t worry too much because “it’s only Meredith”), burns his foot on a George Foreman grill (then tries to get Pam to put butter on it), and thinks Wikipedia is a reliable source of information (okay, we’re all guilty of that). But despite his weak points, the character is more than the sum of his foolish parts. Michael is multi-faceted, a man who develops over the years into a fully-realized adult, forming close bonds with his co-workers who initially despised him. He starts off a childish, stunted individual: slow with romance (having been with only a handful of women in over 40 years), collecting knowledge about the world around him (he didn’t go to college and has never left Scranton), and slow in learning how his words and actions affect other people. But he figures all that out, little by little. Michael is relatable and sympathetic because he is so deeply flawed, reminding us, in the end, that there’s a little Michael Scott in all of us. Michael is also sexist. He doesn’t know much about women, but he certainly thinks their looks to be deserving of intense scrutiny. When Pam wears glasses, he’s quick to let her know how ugly she looks. When Michael breaks up with his girlfriend Jan (whom he describes as “flat-chested,”) she gets breast implants, and he decides to take her back. Michael makes fun of the office’s women on the daily, zeroing in with derogatory asides, especially via hurtful statements aimed toward Phyllis and Meredith. Lots of what he says to Pam borders dangerously on sexual harassment, though this gets better with time. In fact, his relationship with Pam transitions slowly into one of paternal affection, and he develops a similar relationship with Erin later on. When he meets Holly, a woman who actually likes and respects him, he learns to respect her back. From there, Michael continues to grow and learn about what’s important and what isn’t, eventually leading him to a more P.C. path (thank God). “Would I rather be feared or loved? That’s easy. Both. I want people to be afraid of how much they love me,” Michael says, exposing a fundamental need he has: to be liked. Although he never stops making jokes, beneath it all Michael is supremely tormented by loneliness. He tries to connect with people in the best way he knows how, but usually fails. When he buys a new phone plan and is allowed unlimited calls to his top five friends, he doesn’t even have five friends to add. In a particularly affecting Season 2 moment, Michael recalls the many Halloween costumes he’s worn to work over the years, talking about how much he loves dressing up at the office. But afterwards, the camera follows Michael home to an empty house, where we see him handing out Halloween candy to trick-or-treaters by himself. The juxtaposition between the brave face Michael puts on at work and his solitary home life often serves as an emotional gut-punch. We know why he doesn’t have anyone — he’s hardly an appealing prospect — but he’s still a human being, and it is a little heartbreaking to watch someone who craves human contact be continually denied it. Michael is so terrified of being alone he eventually enters into an abusive relationship with Jan, his manipulative supervisor. In the fourth season’s “Dinner Party” episode (one of the show’s cringe-inducing triumphs), we see what a tight leash Michael is kept on, as he reveals the number of times Jan has forced him to have a vasectomy and then get it reversed because she can’t make up her mind about having children. Yikes. Yet another onion-layer to peel back; Michael is openly in love with Ryan the temp (played by B.J. Novak) for most of the series. This relationship exists as one of the show’s best running jokes, taking a recognizably straight character and blurring the lines of his sexuality. Michael clearly lusts after Ryan, in some sense — even though he’s otherwise attracted to women. In an unexpectedly open-minded way, Michael doesn’t ever question these amorous feelings, though he usually (and incorrectly) puts them down to he and Ryan being “best friends.” Still, Michael also awards Ryan the “hottest in the office” Dundie year after year. You do the math. He chooses perfect friends — and enemies. 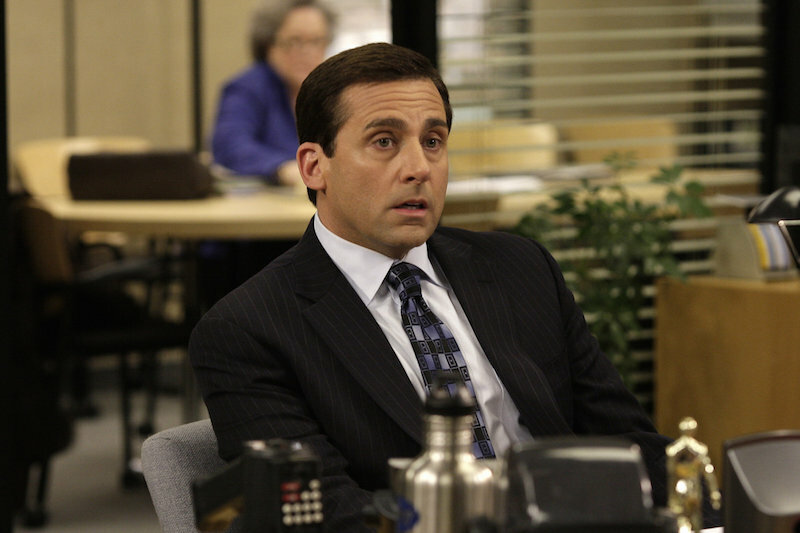 Michael drops one of the series’ most legendary insults during a conference meeting: “If I had a gun with two bullets and I was in a room with Hitler, Bin Laden, and Toby, I would shoot Toby twice.” Toby is the office’s HR rep, and the only person in Michael’s crew he doesn’t love. His hatred for Toby, of course, represents his fear of limitations. Toby is there to put a cap on Michael’s senseless shenanigans, but Michael sees Toby as trying to stop him from having fun. Toby wants to make things safe and appropriate, but those words are dirty ones in Michael’s handbook. Plus, let’s face it: Toby is a bore. He’s bland, repetitive, and maddeningly timid. He cares about art — and people. No one could mistake Michael for an intellectual. But truth be told, he has a pretty solemn respect for the creative process. He comes up with the Willy Wonka golden ticket idea, an imaginative marketing strategy combining whimsy with business. He cuts together a commercial for Dunder Mifflin that he wrote and directed himself, starring all his employees; Corporate refuses to air the commercial, using a generic one instead, but Michael’s ad was profound and original. In one of the series’ all-time greatest scenes, Michael shows up to Pam’s art show in Season 3. (It’s no surprise this episode was directed by Joss Whedon.) It’s one of those delicate moments that makes “The Office” so great; Pam wants to be an artist, but she’s only a receptionist. She hoped her friends from the office would come to a local exhibit of her watercolor paintings, but none of them showed any interest — except Oscar, who came for a dose of culture and brought his snooty boyfriend Gil. Pam overhears Gil calling her work “motel art,” unsuccessful because the artist was neither honest nor courageous, and Oscar doesn’t even stick up for her. But then Michael shows up, and he not only appreciates her work, he understands it. He sees a quiet beauty in Pam’s watercolors, which capture simple, ordinary routines and the office building where they live their lives. Michael buys the painting, and hangs it proudly on his wall. He wants to give back. This is it: the crowning jewel of excruciating awkwardness. In Season 6, Michael has to tell a high school class of underprivileged students he cannot pay for their college tuition, as he promised he would a decade earlier. This demonstrates Michael’s impressive lack of touch with reality; he made the promise thinking he would be a millionaire by the time he turned 40, though of course he’s not even close. “Maybe by the time I’m 50, I don’t know,” he says helplessly, to a class of incensed kids. All of “Scott’s Tots” — as the newspapers dubbed the group he promised tuition — resisted drugs and dropping out of school because they had a guardian angel watching over them, a wealthy benefactor who would someday pay their way through school. That was Michael. When he admits he doesn’t have the money after all, their rage is understandable. But the graduation rate of Scott’s Tots was higher than the rest of the school’s, suggesting that because Michael gave them a spark of hope, they all worked harder to earn their high school degree. “Some people have evil dreams, some people have selfish dreams, or wet dreams,” Michael points out in his defense. And he’s right. He is delusional, but at least he dreams big. Touched by the students and their disadvantages, Michael wanted to help. Ultimately, he vows to pay for the college textbooks of one boy in the class (still a hefty $4,000), if the student can find a way to pay for his own tuition. It might not be much, but it’s something. He learns far more than anyone could expect. For seven years, “The Office” trailed a deluded man who fancied himself courageous and intelligent. He went alone into the woods, believing he could conquer the elements — and almost died eating poison mushrooms. He set up a company basketball game against the warehouse, hoping he could show his true star sportsmanship, but didn’t sink a single shot. What Michael doesn’t realize, perhaps until meeting Holly, is that he’s not a genius. He isn’t even especially talented. Through Holly’s eyes, he realizes his movie “Threat Level Midnight” is actually pretty dumb. He was prouder of that film than anything, but once he knows his future wife, his greatest project no longer matters. Why? Michael finally gets that he doesn’t need to be the bravest, smartest, or best salesman in the world in order to be worth something. He cares about people, and he never stops dreaming, whether it be of finding true love or paying for the education of a bunch of teenagers. That’s good enough. “Never give up,” is what he tells Jim on the booze cruise, when Jim first confesses his feelings for Pam. And Jim doesn’t give up. Neither does Michael. They both see the fruits of those labors in the end. READ MORE: SXSW Review: ‘Angie Tribeca’ Delivers Crazy Gags and Great Guest Stars — Who Needs Depth?